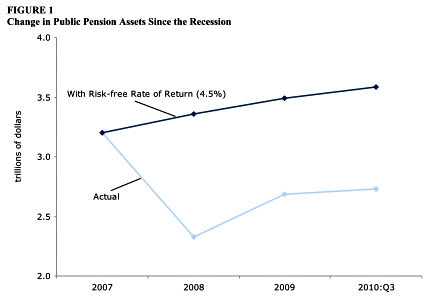 Dean calculates that if pension funds continue to invest in a basket of assets that includes equities, and economic performance remains at historical levels, most states have a pension shortfall of less than 0.2% of income. If this is right, then either modest changes in state contributions or modest changes in employee contributions (or a combination of both) are all that’s necessary to eliminate the pension shortfall entirely. It’s just not as big a problem as critics are suggesting.